Carla Osawamick stands in front of a class of students with a wide range of life experiences, from one still in high school to a great-grandmother. The students all have one thing in common: they are dedicated to learning and speaking Anishinaabemowin, the language spoken by many Native Americans in the Great Lakes region, including the Little Traverse Bay Bands of Odawa Indians. 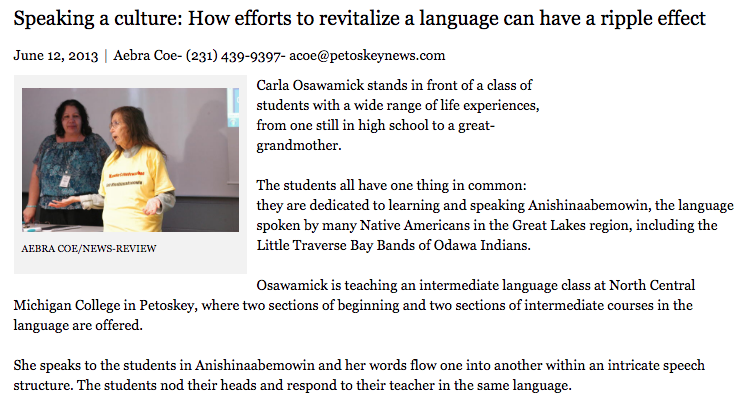 Osawamick is teaching an intermediate language class at North Central Michigan College in Petoskey, where two sections of beginning and two sections of intermediate courses in the language are offered. From the Rebuilding Native Nations Course Series: "The Benefits of Intergovernmental Relations"